The F-22 Raptor is an American fighter aircraft that utilizes stealth technology. It is an air superiority fighter, but is equipped for ground attack, electronic warfare and signals intelligence roles as well. The United States Air Force considers the F-22 a critical component of the US Global Strike Task Force. Faced with a protracted development period, the aircraft was variously designated F-22 and F/A-22 during the three years before formally entering United States Air Force service in December 2005, as the F-22A. Lockheed Martin Aeronautics is the prime contractor and is responsible for the majority of the airframe, weapon systems and final assembly of the F-22. Along with Lockheed Martin, partner Boeing Integrated Defense Systems provides the wings, aft fuselage, avionics integration, and all of the pilot and maintenance training systems. The Advanced Tactical Fighter (ATF) contract was a demonstration and validation program undertaken by the United States Air Force to develop a next-generation air superiority fighter to counter emerging worldwide threats, including development and proliferation of Soviet-era Su-27 "Flanker"-class fighter aircraft. 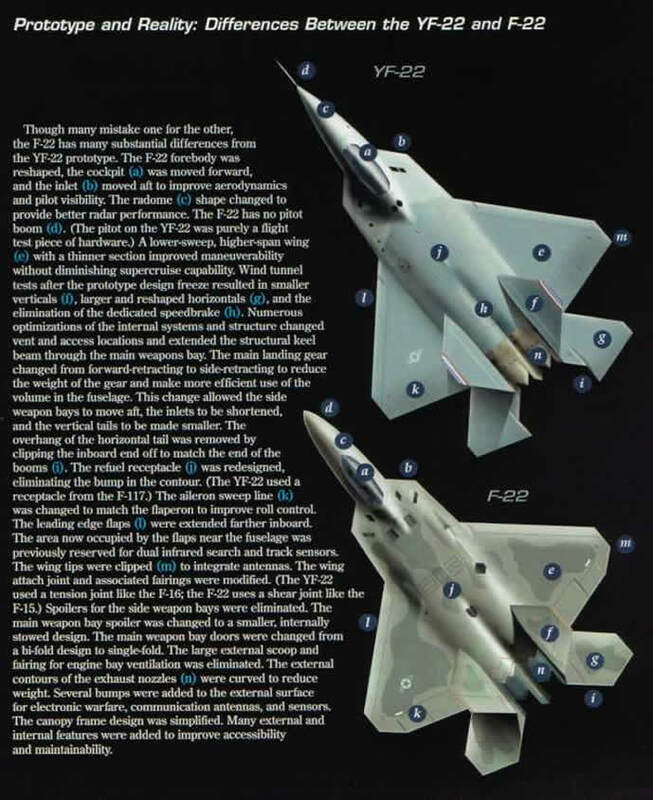 The original Lockheed Advanced Tactical Fighter concept (1986)In 1981, USAF developed a requirement for a new air superiority fighter intended to replace the capability of the F-15 Eagle. It was envisaged that the ATF would incorporate emerging technologies including advanced alloys and composite materials, advanced fly-by-wire flight control systems, higher power propulsion systems, and low-observable/stealth technology. 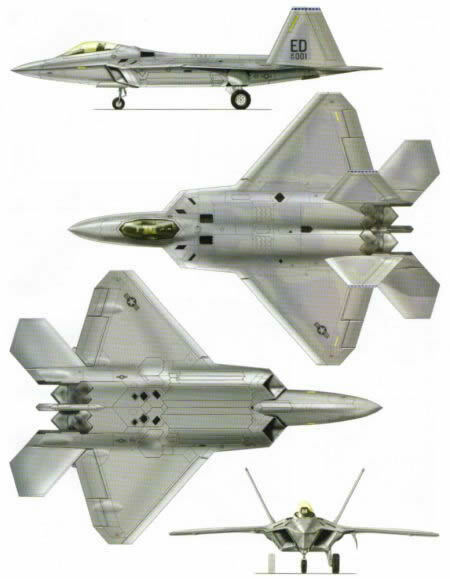 The original Boeing Advanced Tactical Fighter concept (1986)Following a hard-fought fly-off competition, in August 1991 the YF-22 was declared the winner and Lockheed was awarded the contract to develop and build the Advanced Tactical Fighter. The first production F-22 was delivered to Nellis Air Force Base, Nevada, on 14 January 2003 and "Dedicated Initial Operational Test and Evaluation" commenced on 27 October 2004. By 2004, 51 Raptors were in service. The first crash of a production F-22 occurred during takeoff at Nellis Air Force Base on 20 December 2004, in which the pilot ejected safely moments before impact. The crash investigation revealed that a brief interruption in power during an engine shutdown prior to flight caused a malfunction in the flight-control system. In August 2007, the United States Air Force signed a $5 billion, multi-year contract with Lockheed Martin that will extend production to 2011. 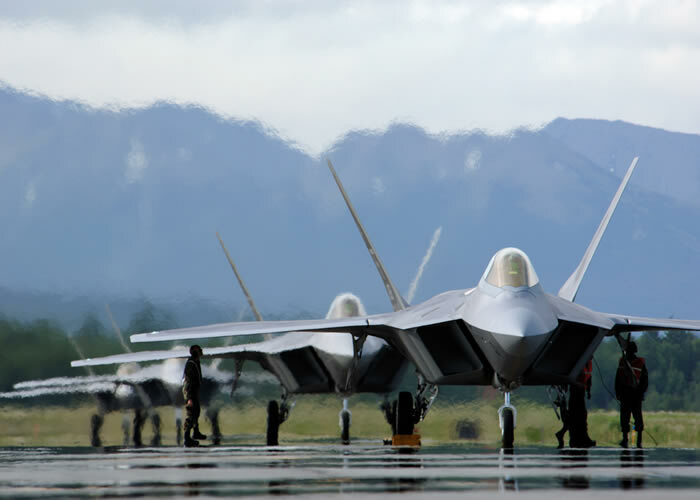 As of 2007, F-22 Raptors are being procured at the rate of 20 per year. In a ceremony on 29 August 2007, Lockheed Martin reached its "100th F-22 Raptor" milestone, delivering aircraft 05-4100. Two F-22s, the upper one being the first EMD F-22, "Raptor 01"The United States Air Force originally planned to order 750 ATFs, with production beginning in 1994; however, the 1990 Major Aircraft Review altered the plan to 648 aircraft beginning in 1996. The goal changed again in 1994, when it became 442 aircraft entering service in 2003 or 2004, but a 1997 Department of Defense report put the purchase at 339. In 2003, the Air Force said that the existing congressional cost cap limited the purchase to 277. By 2006, the Pentagon said it will buy 183 aircraft, which would save $15 billion but raise the cost of each aircraft, and this plan has been de facto approved by Congress in the form of a multi-year procurement plan, which still holds open the possibility for new orders past that point. The total cost of the program by 2006 was $62 billion. In April 2006, the cost of the F-22A was assessed by the Government Accountability Office to be $361 million per aircraft. 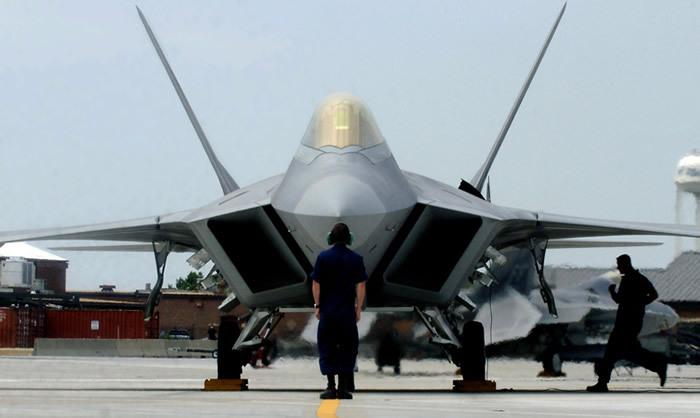 This cost reflects the F-22A total program cost, divided by the number of fighters the Air Force is programmed to buy; and which has so far invested $28 billion in the Raptor's research, development and testing. That money, referred to as a "sunk cost", is already spent and is separate from money used for future decision-making, including procuring a copy of the jet. By the time all 183 fighters have been purchased, $34 billion will have been spent on actual procurement, resulting in a total program cost of $62 billion or about $339 million per aircraft. The incremental cost for one additional F-22 is around $137 million; decreasing with larger volumes. If the Air Force were to buy 100 more F-22s today, the cost of each one would be less than $117 million and would continue to drop with additional aircraft purchases. F-22A Raptors over Utah in their first official deployment, October 2005. The F-22 is not the most expensive aircraft aloft. That distinction likely belongs to the roughly $2.2 billion-per-unit B-2 Spirit, whose orders went from hundreds to a few dozen when the Cold War ended thus making the unit cost skyrocket, though the incremental cost was under US $1 billion. The F-22 uses fewer radar absorbent materials than the B-2 or F-117 Nighthawk, which is expected to translate into lower maintenance costs. On 31 July 2007, Lockheed Martin received a multiyear contract for 60 F-22s worth a total of US $7.3 billion. 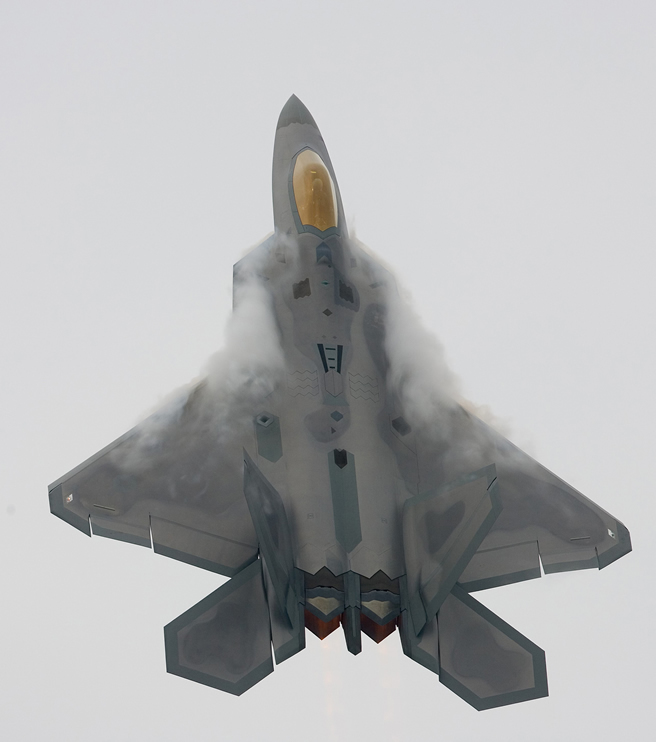 The contract brings the number of F-22s on order to 183 and extends production through 2011. During the recent grounding of nearly 700 F-15s, some U.S. 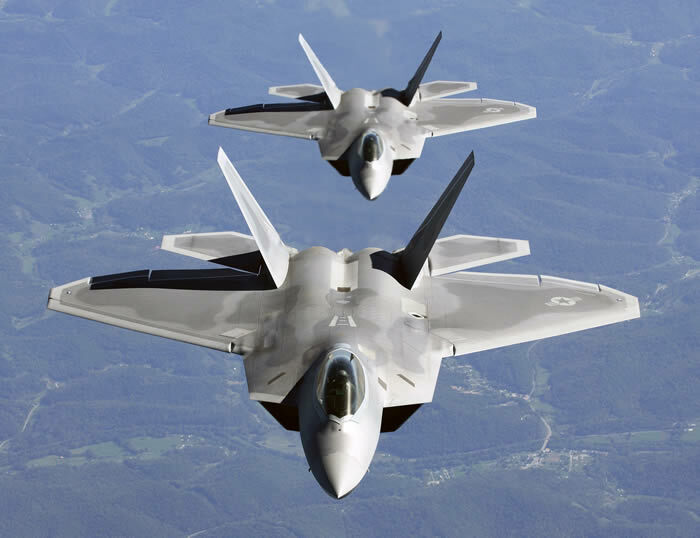 Senators demanded that Deputy Secretary of Defense Gordon England release three government reports that support additional F-22 Raptors beyond the planned 183 jets. Forbes has reported that the USAF plans to extend the production of the F-22 past 2011. This is believed to a response to the recent grounding of F-15A-D. Unlike many other tactical fighters, the opportunity for export is currently non-existent because the export sale of the F-22 is barred by federal law. There was a time in the 1970s when the then-new F-16 also had many restrictions. However, regardless of restrictions, very few allies would even be considered for export sale because the F-22 is such a sensitive and expensive system. Most current customers for US fighters are either acquiring earlier designs like the F-15, or F-16 or are waiting to acquire the F-35, which contains much of the F-22's technology but is designed to be cheaper and more flexible. More recently Japan reportedly showed some interest in buying F-22As in its Replacement-Fighter program for its Air Self-Defense Force (JASDF). In such an event, it would most likely involve a "watered-down" export variant while still retaining most of its advanced avionics and stealth characteristics. However, such a proposal would still need approval from the Pentagon, State Department and Congress. Some Australian defense commentators have proposed that Australia purchase F-22 aircraft instead of the F-35. In 2006, the Australian Labor Party, Australia's main opposition party at the time, supported this proposal on the grounds that the F-22 is a proven, highly capable aircraft while the F-35 is still under development. The then-current Australian Government, however, ruled out the purchase of the F-22 on the grounds that it is unlikely to be released for export, and does not meet Australia's requirements for a strike aircraft. This assessment was supported by the Australian Strategic Policy Institute, a non-partisan, government-funded think-tank, which claimed that the F-22 "has insufficient multi-role capability at too high a price" for Australia. Several small design changes were made from the YF-22A prototype to the production F-22A. The swept-back angle on the wing's leading edge was decreased from 48 degrees to 42 degrees, while the vertical stabilizer area was decreased 20%. To improve pilot visibility, the canopy was moved forward 7 inches (178 mm) and the engine intakes were moved rearward 14 inches (356 mm). The shape of the wing and stabilator trailing edges was refined to improve aerodynamics, strength, and stealth characteristics. F-22 Raptor displaying its F119-PW-100 engines on full afterburnerThe F-22 is a fifth-generation fighter that is considered a fourth-generation stealth aircraft by the US Air Force. Its dual afterburning Pratt & Whitney F119-PW-100 turbofans incorporate thrust vectoring, but in the pitch axis only, with a range of ±20 degrees. The maximum thrust is classified, though most sources place it at about 35,000 lbf (156 kN) per engine. Maximum speed, without external weapons, is estimated to be Mach 1.72 in supercruise mode; as demonstrated by General John P. Jumper, former U.S. Air Force Chief of Staff, when his Raptor exceeded Mach 1.7 without afterburners on 13 January 2005. With afterburners, it is "greater than Mach 2.0" (1,317 mph, 2,120 km/h), according to Lockheed Martin; however, the Raptor can easily exceed its design speed limits, particularly at low altitudes, with max-speed alerts to help prevent the pilot from exceeding them. Former Lockheed Raptor chief test pilot Paul Metz stated that the Raptor has a fixed inlet; but while the absence of variable intake ramps may theoretically make speeds greater than Mach 2.0 unreachable, there is no evidence to prove this. Such ramps would be used to prevent engine surge, but the intake itself may be designed to prevent this. Metz has also stated that the F-22 has a top speed greater than 1,600 mph (Mach 2.42) and its climb rate is faster than the F-15 Eagle due to advances in engine technology, despite the F-15's thrust-to-weight ratio of about 1.2:1, with the F-22 having a ratio closer to 1:1. The US Air Force claims that the F-22A cannot be matched by any known or projected fighter. 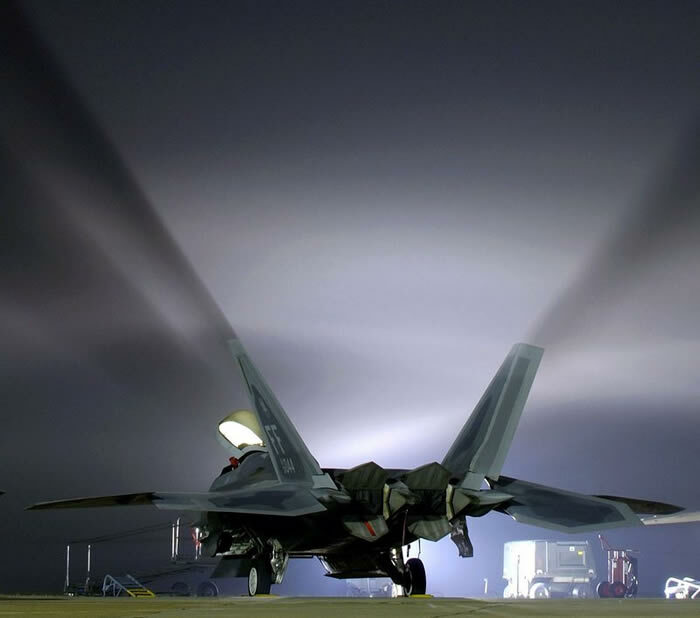 The true top-speed of the F-22 is largely unknown to the general public, as engine power is only one factor. The ability of the airframe to withstand the stress and heat from friction is a further, key factor, especially in an aircraft using as many polymers as the F-22. However, while some aircraft are faster on paper, the internal carriage of its standard combat load allows the aircraft to reach comparatively higher performance with a heavy load over other modern aircraft due to its lack of drag from external stores. It is one of only a handful of aircraft that can sustain supersonic flight without the use of afterburner augmented thrust (and its associated high fuel usage). This ability is called supercruise. The F-22 is highly maneuverable, at both supersonic and subsonic speeds. The F-22's thrust vectoring nozzles allow the aircraft to turn tightly, and perform extremely high alpha (angle of attack) maneuvers such as the Herbst maneuver (or J-turn), Pugachev's Cobra, and the Kulbit, though the J-Turn is more useful in combat. 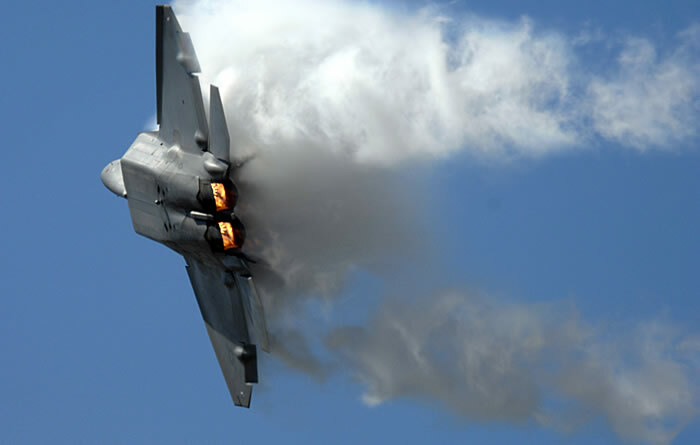 The F-22 is also capable of maintaining a constant angle of attack of over 60°, yet still having some control of roll. 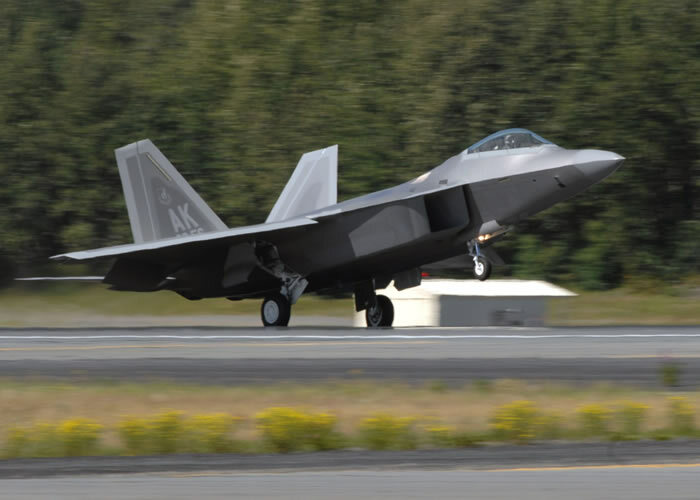 During June 2006 exercises in Alaska, F-22 pilots demonstrated that cruise altitude has a significant effect on combat performance, and routinely attributed their altitude advantage as a major factor in achieving an unblemished kill ratio. 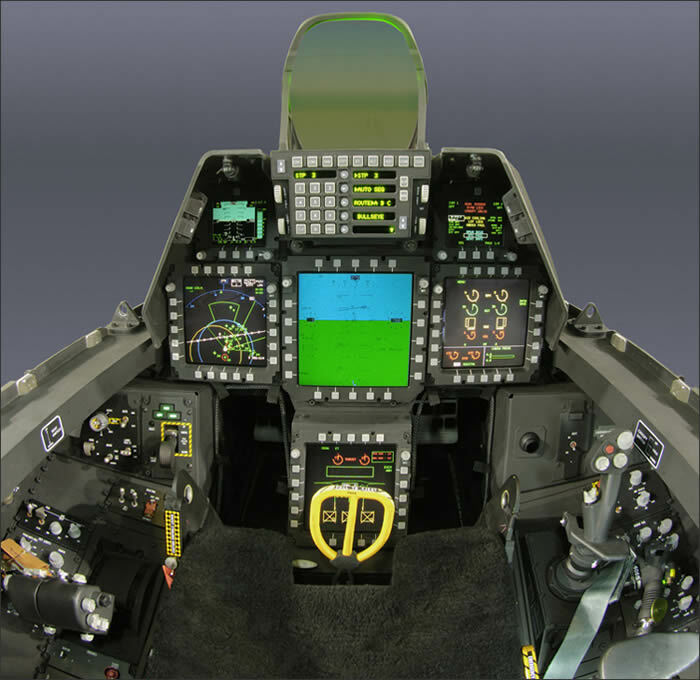 The F-22's avionics include BAE Systems E&IS (formerly Sanders Associates) radar warning receiver (RWR) AN/ALR-94, and the Northrop Grumman AN/APG-77 Active Electronically Scanned Array (AESA) radar. The AN/APG-77 is possibly the most capable radar in active service, with both long-range target acquisition and low probability of interception of its own signals by enemy aircraft. The AN/ALR-94 is a passive receiver system capable of detecting the radar signals in the environment. Composed of more than 30 antennae smoothly blended into the wings and fuselage, it is described by the former head of the F-22 program at Lockheed Martin Tom Burbage as "the most technically complex piece of equipment on the aircraft." With greater range (250+ nmi) than the radar, it enables the F-22 to limit its own radar emission which might otherwise compromise its stealth. As the target approaches, AN/ALR-94 can cue the AN/APG-77 radar to keep track of its motion with a narrow beam, which can be as focused as 2° by 2° in azimuth and elevation. A pair on patrol.The radar’s information is processed by two Raytheon Common Integrated Processor (CIP)s. Each CIP operates at 10.5 billion instructions per second and has 300 megabytes of memory. Information can be gathered from the radar and other onboard and offboard systems, filtered by the CIP, and offered in easy-to-digest ways on several cockpit displays, enabling the pilot to remain on top of complicated situations. The Raptor’s software is composed of over 1.7 million lines of code, most of which concerns processing data from the radar. The radar has an estimated range of 125-150 miles, though planned upgrades will allow a range of 250 miles or more in narrow beams. The F-22 is capable of functioning as a "mini-AWACS." Though reduced in capability compared to dedicated airframes such as the E-3 Sentry, as with its threat identification capability, the F-22's forward presence is often of benefit. The system allows the F-22 to designate targets for cooperating F-15s and F-16s, and even determine if two friendly aircraft are targeting the same enemy aircraft, thus enabling one of them to choose a different target. It is often able to identify targets hundreds of times faster than accompanying dedicated AWACS. The IEEE-1394B data bus, developed for the F-22, was derived from the commercial IEEE-1394 bus system, often used on personal computers. The bus was subsequently deployed on the derivative F-35 Lightning II fighter. An F-22 releases a JDAM from its internal bay while flying at supersonic speed. The Raptor is designed to carry air-to-air missiles in internal bays to avoid disrupting its stealth capability. Launching missiles requires opening the weapons bay doors for less than a second, while the missiles are pushed clear of the airframe by hydraulic arms. The aircraft can also carry bombs such as the Joint Direct Attack Munition (JDAM) and the new Small-Diameter Bomb (SDB). The Raptor carries an M61A2 Vulcan 20 mm rotary cannon, also with a trap door, in the right wing root. The M61A2 is a last ditch weapon, and carries only 480 rounds; enough ammunition for approximately five seconds of sustained fire. Despite this, the F-22 has been able to use its gun in dogfighting without being detected, which can be necessary when missiles are depleted. As other air forces upgrade capabilities in the areas of air-to-air and air-to-ground munitions, one key aspect of the Raptor must be kept in mind. Its very high sustained cruise speeds, and operational altitude (something that is often ignored), add tremendously to the effective range of both air-to-air and air-to-ground munitions. Indeed, these factors could provide a strong rationale as to why the USAF has not pursued long-range, high-energy air-to-air missiles such as the MBDA Meteor. However the USAF plans to procure the AIM-120D AMRAAM, which will have a significant increase in range compared to the AIM-120C. The launch platform, in this case, provides the additional energy to the missile. This speed and altitude characteristic also helps improve the range of air-to-ground ordnance. While specific figures remain classified, it is expected that JDAMs employed by F-22s will have twice or more the effective range of munitions dropped by legacy platforms. In testing, a Raptor dropped a 1,000 lb (450 kg) JDAM from 50,000 feet (15,000 m), while cruising at Mach 1.5, striking a moving target 24 miles away. The SDB, as employed from the F-22, should see even greater increases in effective range, due to the improved lift to drag ratio of these weapons. While in its air-superiority configuration, the F-22 carries its weapons internally, though it is not limited to this option. The wings are capable of supporting four detachable hardpoints. Each hardpoint is theoretically capable of handling 5,000 lb of ordnance. However, use of external stores greatly compromises the F-22's stealth, and has a detrimental effect on maneuverability, speed, and range. As many as two of these hardpoints are "plumbed", allowing the usage of external fuel tanks. The hardpoints are detachable in flight allowing the fighter to regain its stealth once these external stores are exhausted. Currently, there is research being conducted to develop a stealth ordnance pod and hardpoints for it. Such a pod would comprise a stealth shape and carry its weapons internally, then would split open when launching a missile or dropping a bomb. Both the pod and hardpoints could be detached when no longer needed. This system would allow the F-22 to carry its maximum ordnance load while remaining stealthy, albeit at a loss of maneuverability. However, there is concern over this program as external carriage of fuel tanks has shown more stress placed on the wings than originally anticipated. Although several recent Western fighter aircraft are less detectable on radar than previous designs using techniques such as radar absorbent material-coated S-shaped intake ducts that shield the compressor fan from reflecting radar waves, the F-22A design placed a much higher degree of importance on low observance throughout the entire spectrum of sensors including radar signature, visual, infrared, acoustic, and radio frequency. The stealth of the F-22 is due to a combination of factors, including the overall shape of the aircraft, the use of radar absorbent material (RAM), and attention to detail such as hinges and pilot helmets that could provide a radar return. However, reduced radar cross section is only one of five facets that designers addressed to create a stealth design in the F-22. 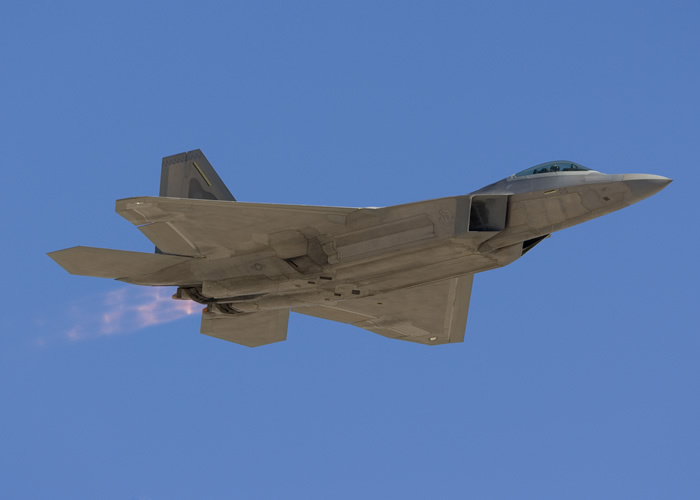 The F-22 has also been designed to disguise its infrared emissions to make it harder to detect by infrared homing ("heat seeking") surface-to-air or air-to-air missiles. Designers also addressed making the aircraft less visible to the naked eye, controlling radio transmissions, and noise abatement. The 27th Fighter Squadron at Langley Air Force Base was the first squadron to receive the F-22A Intended to be the leading American advanced tactical fighter in the early part of the 21st century, the Raptor is the world's most expensive fighter to date with an incremental cost of about US$138 million per unit. The number of aircraft to be built has dropped to 183, down from the initial requirement of 750. Part of the reason for the decrease in the requirement is that the F-35 Lightning II uses much of the technology used on the F-22, but at a much more affordable price. To a large extent the cost of these technologies is only lower for the F-35 because they have already been developed for the F-22. 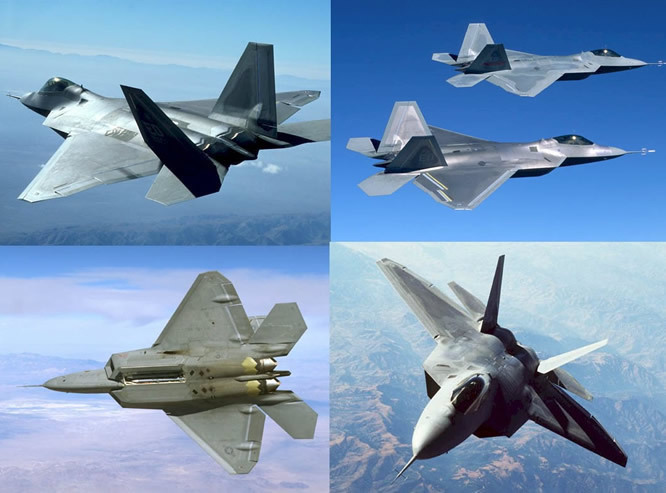 The YF-22 was a developmental aircraft that led to the F-22; however, there are significant differences between the YF-22 and the F-22. Relocation of cockpit, structural changes, and many other smaller changes exist between the two types. The two are sometimes confused in pictures, often at angles where it is difficult to see certain features. For example, there are some F-22 with pitot booms which some think are only found on the YF-22. The YF-22 was originally given the unofficial name "Lightning II" by Lockheed, which persisted until the mid-1990s when the USAF officially named the aircraft "Raptor". For a short while, the aircraft was also dubbed "SuperStar" and "Rapier". The F-35 later received the Lightning II name on 7 July 2006. An F-22 refuels from a KC-135; the attachment on the back top is for a spin recovery chuteTesting of the F-22 began in 1997 and has been curtailed to save program costs, but risks hiding flaws until a point at which fixing flaws becomes unaffordable. The U.S. General Accounting Office cautioned, "Moreover, engine and stealthiness problems already disclosed by the DoD, and the potential for avionics and software problems, underscore the need to demonstrate the weapon system’s performance through flight testing before significant commitments are made to production." Raptor 4001 was retired and sent to Wright-Patterson AFB to be fired at for testing the fighter's survivability. Usable parts of 4001 would be used to make a new F-22. Another EMD F-22 was also retired and likely to be sent to be rebuilt. A testing aircraft was converted to a maintenance trainer at Tyndall AFB. An F-22 observes as an F-15 Eagle banks left. 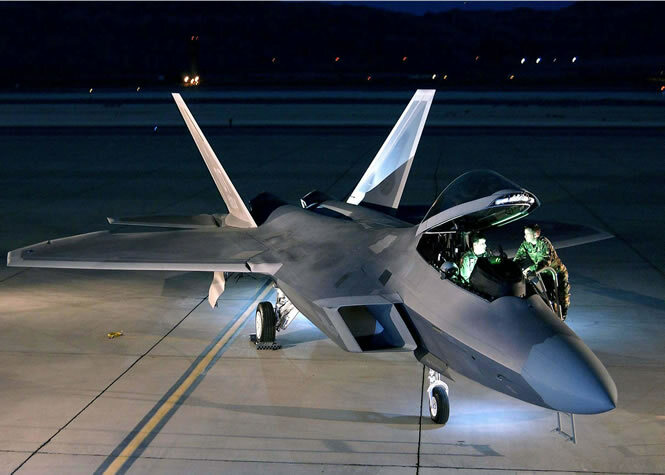 The F-22 is slated to replace the F-15C/D.In 2006, the Raptor's development team, composed of Lockheed Martin and over 1,000 other companies, plus the United States Air Force, won the Collier Trophy, American aviation's most prestigious award. The U.S Air Force will acquire 183 F-22s which will be divided among seven squadrons. During Exercise Northern Edge in Alaska in June 2006, the F-22 downed 108 adversaries with no losses in simulated combat exercises. While attempting its first overseas deployment to the Kadena Air Base in Okinawa, Japan, on 11 February 2007, a group of six Raptors flying from Hickam AFB experienced multiple computer crashes coincident with their crossing of the 180th meridian of longitude (the International Date Line). The computer failures included at least navigation (completely lost) and communication. The fighters were able to return to Hawaii by following their tankers in good weather. 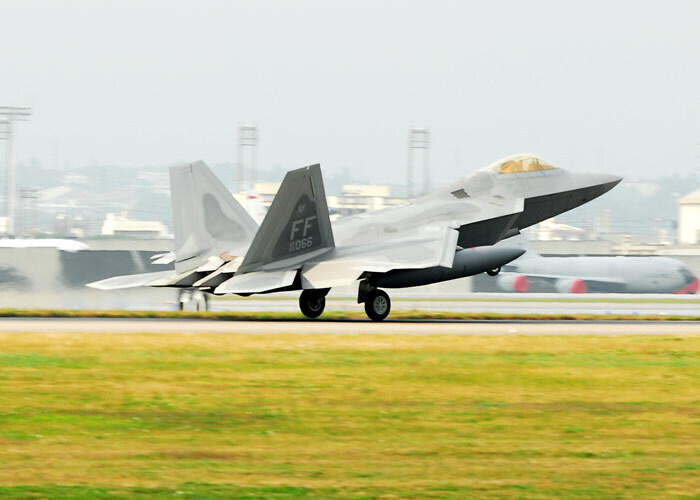 The error was fixed within 48 hours and the F-22s continued their journey to Kadena. On 30 April 2007, the National Museum of the Air Force announced that EMD Raptor 91-4003 will be put on display in the space being occupied by the YF-22 sometime in July 2007 and prior to the USAF's 60th Anniversary celebration in October 2007. That particular Raptor is being refurbished in the restoration area of the Museum. There are plans to move the YF-22 to another museum and that will be decided in due time by the National Museum of the Air Force. On 12 December 2007, the USAF officially declared the F-22 fully operational, three years after the first F-22 Raptor arrived at Langley Air Force Base. Another more recent proposal is the FB-22, which would be used as a deep strike bomber for the USAF, but there has yet to be any word on whether the USAF plans further development of the program. Also, the X-44 MANTA, short for Multi-Axis, No-Tail Aircraft, is an experimental aircraft which itself is an F-22 with enhanced thrust vectoring controls and no aerodynamic backup (i.e. the aircraft is controlled solely by thrust vectoring, without rudders, ailerons, or elevators). It is scheduled to be tested some time in 2007. 43d Fighter Squadron - The only USAF squadron to operate F-22As at Tyndall AFB, Florida. The 43d was re-established at Tyndall in 2002, and, in 2003, with a corps of 15 Raptor Instructor Pilots, began training student Raptor pilots. The 43d continues to produce new Raptor pilots and serves as the focal point for all F-22 training of pilots and maintainers. 1st Fighter Wing Langley Air Force Base, Virginia. 27th Fighter Squadron - The first deployable F-22 unit in December 2005 after receiving sufficient numbers of trained Raptor pilots and flew the first F-22A operational mission (January 2006 in support of Operation Noble Eagle). They deployed to Kadena Air Base with a complement of 250 Airmen and 12 F-22s. 94th Fighter Squadron - Full complement as of 19 January 2007. 53d Wing Eglin Air Force Base, Florida. 422d Test and Evaluation Squadron - The "Green Bats" are responsible for operational testing, tactics development and evaluation for the F-22. 412th Flight Test Squadron - Conducts developmental tests of F-22 enhancements and modernization. 3d Wing Elmendorf Air Force Base, Alaska. 90th Fighter Squadron - Conversion from F-15Es to F-22s begun; first F-22A arrived 8 August 2007. 525th Fighter Squadron - Not activated yet. 302d Fighter Squadron - An Air Force Reserve Command squadron that will convert from F-16s at Luke Air Force Base and move to Elmendorf AFB. 192nd Fighter Wing - Virginia Air National Guard. 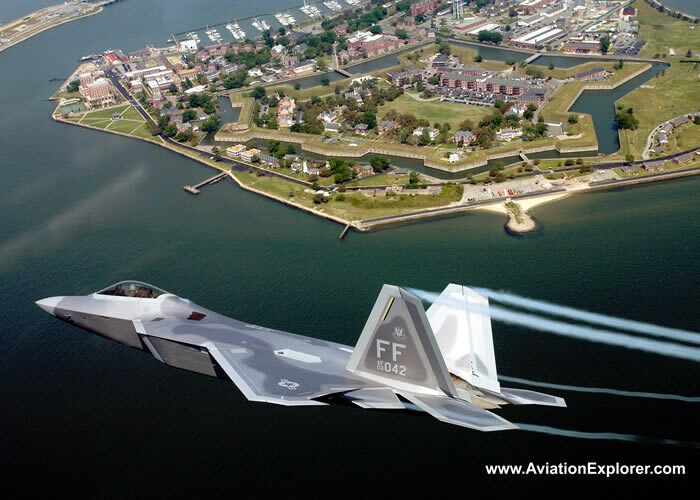 Transitioned from F-16s based in Richmond International Airport, Richmond, VA to F-22s based at Langley AFB, Virginia. 199th Fighter Squadron, Hickam AFB, Hawaii. 531st Fighter Squadron, Hickam AFB, Hawaii. 49th Fighter Wing, Holloman AFB, New Mexico. F-22 with pitot boomData from USAF, F-22 Raptor Team web site, Aviation Week, and Journal of Electronic Defense. Note: It is estimated that internal bays can carry about 2,000 lb (910 kg) worth of bombs, and/or missiles. Four external hardpoints can be fitted to carry weapons or fuel tanks, each with a capacity of about 5,000 lb (2268 kg), while compromising, to a certain extent, the aircraft's stealth. Some armament is still largely classified. Aircraft in this size class since the F-105 have historically met a requirement of carrying maximum external payloads in the range of 14,000-15,000 lb with combat loads typically closer to 4,000-8,000 lb. RWR (Radar warning receiver): 250 nmi (463 km) or more. 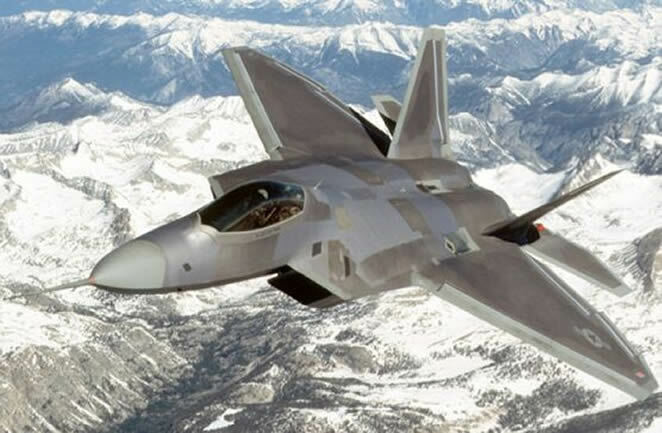 The F-22 has been featured in numerous books, such as Tom Clancy's Debt of Honor (1994) and Fighter Wing (1995) as well as Clive Cussler's Dark Watch (2005). The F-22 made its first major Hollywood debut in the 2007 film Transformers as the form taken by the Decepticon character Starscream. The film was allowed to film actual Raptors in flight, unlike previous computer generated appearances, because of the military's support of director Michael Bay. The Raptors were filmed at Edwards Air Force Base.